Johannesburg, South Africa has a bad rap. On the 4th of July, instead of gnawing on barbecue chicken and guzzling beers beneath dazzling fireworks displays, Shannon and I quietly sipped Castles in The Dungeon, an aptly named bar tucked in a dark, cozy corner beneath the Backpacker’s Ritz in Jo’burg. Given that we had survived our first day there, I felt a bit fond of the city. From the moment we stepped off the plane, I couldn’t shake the ecstatic feeling of being someplace so pleasantly unlike Cairo. It happened almost unexpectedly. One minute I was in a plane where a particularly devolved passenger was smoking a cigarette and the next I was snuggling up in a fleece breathing fresh air. (Which really says something, considering Jo’burg enjoys a generous ribbon of smog itself.) Suddenly, it became impossible to be unhappy. My currency featured pictures of water buffalo and rhinoceros. The airport floor tiles alternated rainbow colors. A Coca Cola vending machine still bore the FIFA logo from the 2010 World Cup. People smiled and struck up casual conversation. 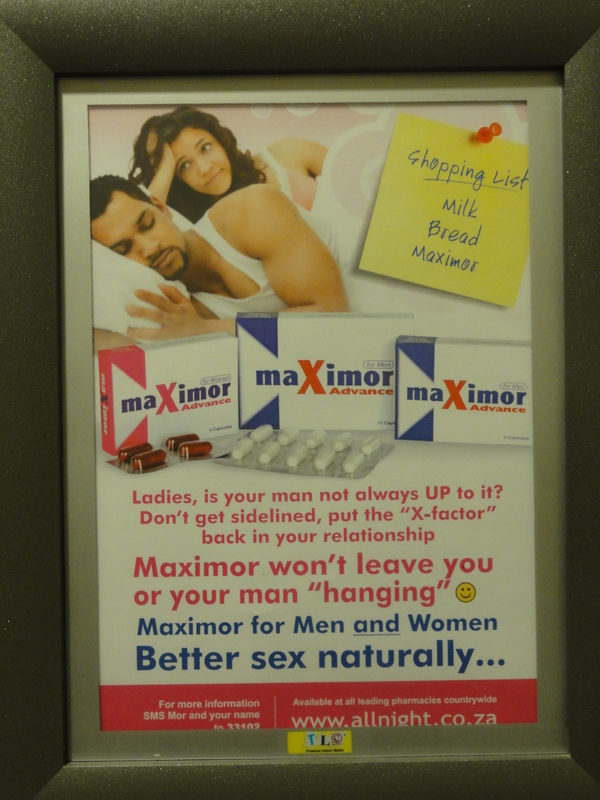 There were ads for sexual performance enhancers in the bathroom stalls. There was toilet paper in the bathroom stalls. Despite all of this, I tried not to get my hopes up. From what it sounded like, the moment I set foot outside the airport I would be accosted by a host of aggressive muggers and thieves, so I had to be prepared. It was with some surprise, then, that I made it to the hostel safe and sound and even ventured out on foot later in the day with Shannon and Alex, a girl we’d met in transit. The walk, which was supposed to terminate at a place called Rosebank, brought with it another surprise. We ultimately got lost and wound up on a street corner. We did nothing to conceal the fact that we were lost, and this worried me. Smart travelers always exhibit confidence and a certainty regarding where they’re supposed to be going. According to the sources, this reduces your chances of being beaten or robbed because you look like you know what you’re doing. Of course, we’d forgotten that logic and idled with blatant uncertainty on the corner beside a stop light where a line of cars waited for a green. It was then that the window of the first car slowly rolled down. A woman sat behind the wheel with a jubilant smile on her face, as though talking to strangers on street corners was a fun pastime everyone could enjoy. Surprised by this amiability, we admitted that we were lost. The light turned green. “What are you looking for?” she asked, ignoring it. “Um, Rose something,” I answered, glancing with rising panic at the green light and the long line of eager drivers. “Oh, Rosebank!” She laughed and gave us directions, but I couldn’t focus. Instead, I viewed the unmoving traffic with trepidation. The woman drove off cheerfully and the line began to move. I was shellshocked. Where were the urgent horns? Why wasn’t anyone persistently driving up against her bumper? Where were the obscenities? By nightfall, the temperature dropped and Shannon and I scored some toasty winter gear at an outdoors store in the mall. 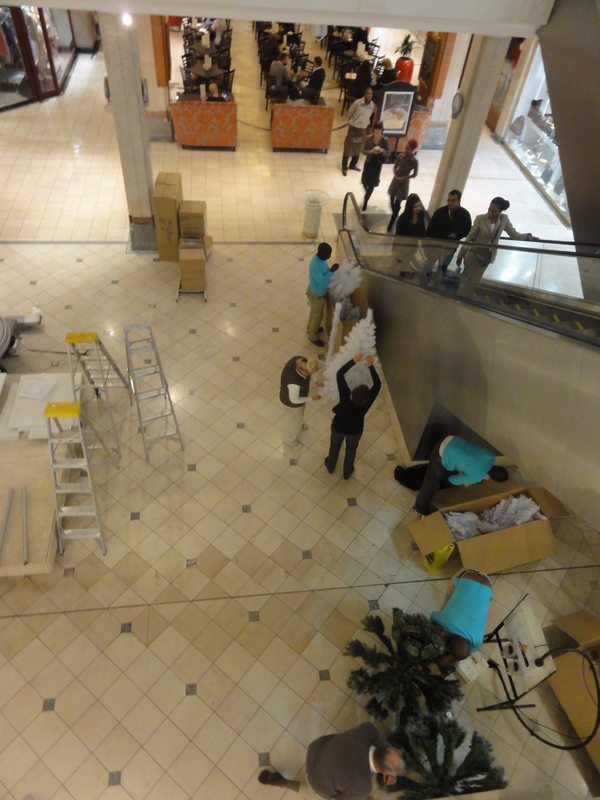 In the atrium, employees fastidiously erected Christmas trees. It was unlike any 4th of July we’d ever had, and we loved Johannesburg for that. In fleeces and scarves, we retreated to the hostel, purchased beer from a vending machine, and spent the evening chatting with an Australian couple who would be on our safari and two friendly Americans who had also survived Johannesburg and whose personalities promised a fabulous trip. 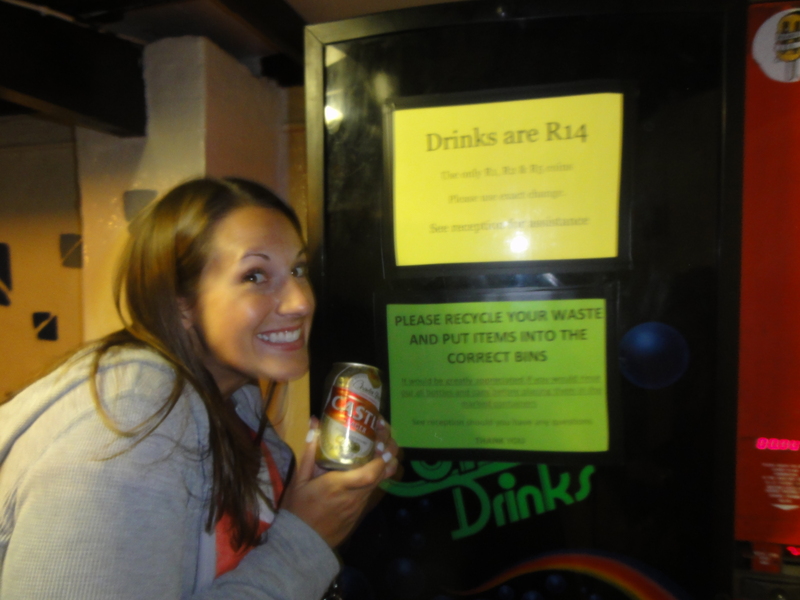 yes, that beer came from a vending machine…a vending machine that sells beer.